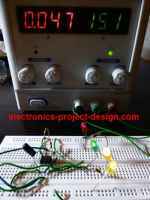 This bar graph LED battery level indicator project is based on LM3914 monolithic IC from National Semiconductor that senses the voltage levels of the battery and drives the 10 light emitting diodes based on the voltage level that is detected. It provides a linear analog display output and has a pin that can be configured to display the output in moving dot or bar graph. 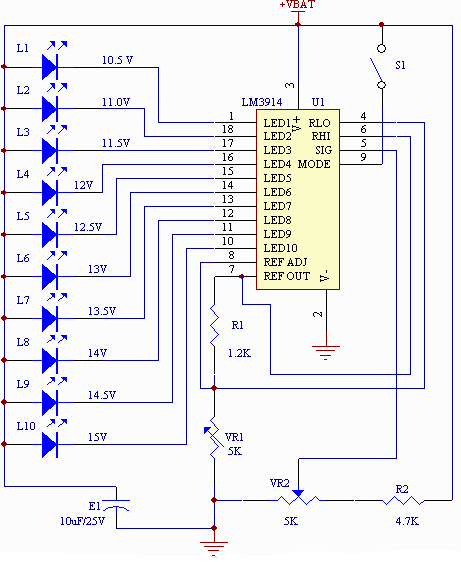 The current driving the LEDs is regulated and programmable hence limiting resistors are not required. The schematic shows how the various components are connected. Switch S1 is used to change the display type from moving dot to bar graph type. When S1 is ON, the display type is bargraph but when it is OFF the display changes to moving dot type. VR1 is used to set the lower limit of the display. By using a variable DC power supply, set the VBAT to 10.5V. Adjust VR1 until the LED L1 turns ON. Next, set the VBAT to 15V, adjust VR2 until all the LEDs turn ON (When S1 is ON).